Forget the modern construct known as “Taco Tuesday.” The family recipes at Las Cazuelas Restaurant have been around since before that was even a thing. We’re talking about before Reaganomics, the rise of disco, and the free love movement. I’m not sure how old you are, but there’s a pretty good chance that the Cadena family and its many branches have been churning out killer enchiladas since before you were even a gleam in your father’s eyeball. For the record, that’s three generations of frying carnitas, roasting tomatillos, and stirring endless vats of fragrant frijoles. FORGET THE MIXER: With famliy recipies dating back 50 years, Las Cazuelas in Nipomo is about as old-school Mexican cool as you can get on the Central Coast. They offer up more than 60 awesome tequilas, and on Tuesday night you can get your hands on a cadillac margarita made with lime juice, salted rim, and Hornitos or 1800 tequila for $5. Naturally, Las Cazuelas’ old-school menu smacks of its own tradition, one that Nipomo locals know well. Here, Tuesdays mean $5 cadillac margaritas made with nothing but fresh lime juice, grand marnier, salted rim, and premium Hornitos (the first thing you see when you walk into the joint is a glass cabinet filled with tequila bottles, so you know owners Mariana and Silvano Luna mean business). You can even get a tequila flight, if you’re feeling frisky. My husband, a true margarita lover, ordered up a couple of the day’s drink specials. They were unreal. We dove into mounds of crispy, lightly salted crack-like chips and red salsa, a rookie move, but so hard to resist. We would have been happy ordering nothing else, but that would have been silly—rude, even. How does one properly toast a milestone like 50 years in business? You’ve got to leave with a doggie bag, while waddling out the door. Now, if you were to randomly ask, “Nipomo for dinner?” we’d both shoot back with a quick “Jocko’s, of course!” It’s where we had our first date and still one of our favorite places to pig out, so I guess we are a little biased (and predictable) when it comes to Nipomo grubbin’. Last week we did the unthinkable, passing Jocko’s welcoming orange neon sign to hang a right on the deserted, unlit corner of South Thompson and Dana Street. WOULD YOU LIKE YOUR STEAK 'WET? 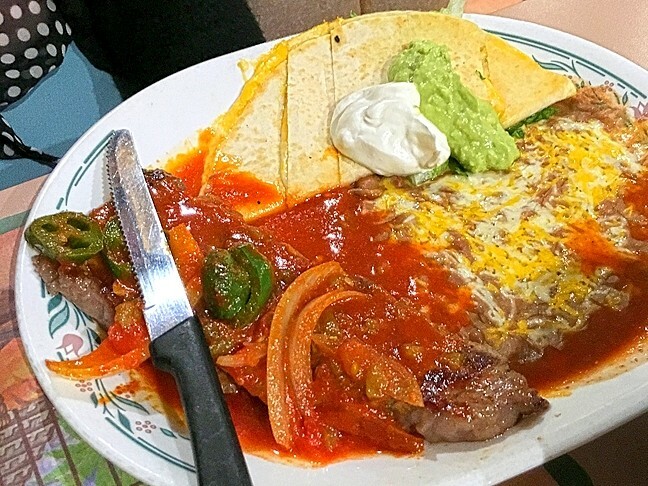 ': The massive Cazuelas steak dinner comes smothered in red sauce and is served with beans, warm tortillas, salad, and a gooey cheese quesadilla. Were we really going to break our code? What if we had been ruined by Jocko’s oak-fire steaks, ranch style beans, and subsequent spumoni ice cream? Part of me—part that I’m not proud of—wanted to turn back. But then I saw a sign from above. Tucked away from the main street in the corner of a nondescript parking lot, we caught our first glimpse of hope: Las Cazuelas’ own neon lights (one pink, one blue, respectively). At that moment, I was ready to experience another tried-and-true Nipomo tradition with clear eyes and a growling tummy. 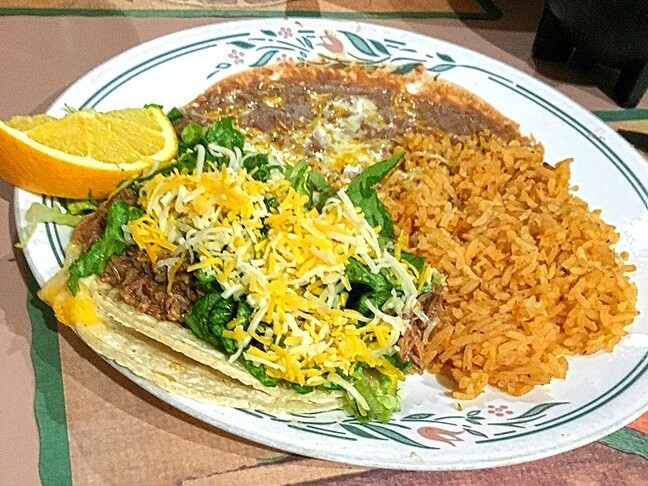 PORTIONS BE DAMNED: The “mini taco combo” with rice and beans at Las Cazuelas is anything but minuscule. Warning: No matter what you order, you will leave full. Maybe it was because we were in the land of hardworking farmers and massive portions or because of my lingering desire for a small Spencer steak, but I ordered the “Cazuelas Steak Dinner,” highlighted with a “star” to indicate its supposed amazingness. Reid ordered what he always does: one taco (shredded beef, this time) with a side of rice and beans. His was really good. But what I ordered was truly amazing. Our waitress brought out not just one hell of a sizzling 8-ounce slab of meat smothered in tangy red sauce, onion, and sliced jalapeno, but also a cheese quesadilla (yes, it comes with the steak dinner), a heaping portion of flavorful refried beans, several extra warm tortillas, sour cream, guacamole, and a crunchy salad topped with fantastic house-made ranch (and even more cheese). This entree cost about $15, and it served well as lunch for the following day. This entree alone is worth a trip to Nipomo in my book. I will be back, Las Cazuelas, and next time I am coming for your carne asada burrito! I won’t lie: Heading back to the 101 under a starry Nipomo sky, we did consider stopping by the Jocko’s bar for a nightcap. However, the idea didn’t excite us like it usually does. Something had shifted forever. Why battle the crowds for a beer when we’d already had an expertly made margarita? We were full and happy and anticipating leftover tacos on Wednesday. I had had my steak and eaten it too. I don’t care how many decades march by. That kind of satisfaction never gets old. 1961: Javier Cadena; his wife, Mariana; and four children Heladio, Francisco, Teresa, and Rosario, relocate from Mexico to Santa Barbara. Javier, who is skilled at recreating authentic Mexican recipes, finds work as a chef (first generation). 1966: After struggling at odd jobs, Javier opens the Cadena family's first restaurant. With everyone playing a role serving patrons, washing dishes, and making the food, the family opens for business on State Street in Santa Barbara. The family goes on to open more than 20 restaurants from Santa Paula to King City. 1978: Working closely with sister Rosario, Francisco Cadena opens the doors of Maya Restaurant in Santa Maria (second generation). HOT PLATE! 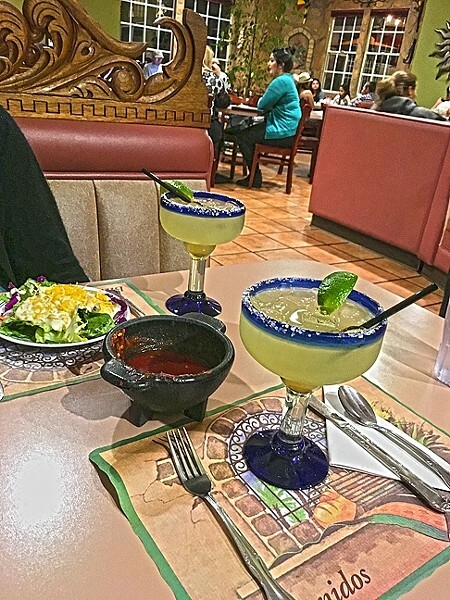 : You, too, can get your fill of authentic Mexican dishes at La Cazuelas, located at 131 W. Dana St. in Nipomo. Hours are 11 a.m. to 9 p.m. daily. For more information, call 929-9030. 1990: Rosario takes over Maya and runs it successfully. When she passes away, her mother, Mariana, continues in the restaurant business while raising her granddaughter, Mariana II. All 13 grandchildren grow up in the family business, and most take on roles at the family's many restaurants across the Central Coast (third generation). 1998: A young man named Silvano Luna begins working for the family. There he meets his future wife, Mariana II. 2006: Mariana II marries Silvano, and the couple operate La Cazuelas together, priding themselves on keeping the traditions and old fashioned recipes alive. Of course, there's always room for something new (they go on to add a full tequila menu featuring more than 60 offerings). February 2016: In appreciation for their loyal customers and in celebration of 50 years in the family business, La Cazuelas offered a "throw back" menu with 1966 prices. Hayley Thomas knows that family-made food just tastes better. She can be reached at hthomas@newtimesslo.com.